The Trump administration can’t make up its mind on China. An unclassified synopsis of the United States’ new national defence strategy, released in January, has the potential to mark an important inflection point in U.S. strategic thinking about defence planning. The document, which follows the national security strategy document the Trump administration released in the final days of 2017, expresses a strong intent to refocus U.S. strategic attention on interstate competition – specifically, a great power competition with Russia and China. Its bottom line is that a great power rivalry is back in East Asia. Not that it ever left. As Chinese military power expands in tandem with Beijing’s regional ambitions and intention to reclaim territory it considers lost, the U.S. needs to think asymmetrically to remain a step ahead of China; especially as the contest for primacy in Asia plays out over the 21st century. 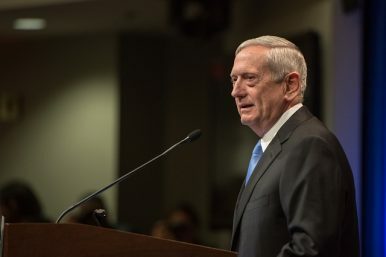 The national defence strategy, which very much represents the thinking of U.S. Secretary of Defence Jim Mattis’, shows why the U.S. needs to think asymmetrically. For example, instead of setting an agenda for matching China’s ascendant People’s Liberation Army Navy hull-for-hull, the document acknowledges that America’s long-standing asymmetric strategic advantage lies in its long-standing global alliances. And conceding that today’s global strategic environment is fast-changing, it emphasises the need for the U.S. to innovate technologically in pursuit of a more lethal military. But alliances and partnerships remain the core of its game plan; especially in Asia. The strategy’s discussion of Asia and the challenges posed by China’s rise into a global powerhouse inherits a lot from the Obama administration’s so-called ‘pivot’ to Asia. But it diverges from the Obama era’s action plan in style more than in substance. In addition to openly contending with the challenge of Chinese military modernisation, the document is clear about China’s desire for near-term “Indo-Pacific regional hegemony” and the future “displacement of the United States to achieve global pre-eminence”. There is strategic vision here. On the one hand, the document shows foresight with its focus on the challenge posed by a rising China beyond the warfighting implications of militarised islands in the South China Sea or Beijing’s considerable investment in advanced technologies. But it ultimately overstates the threat to the continental U.S. from state and nonstate actors and generalises broadly between the divergent threats posed by Russia and China. Moreover, on the question of a “free and open Indo-Pacific” region, the prescriptions in the strategy are mostly inchoate. While the strategy sets out an agenda to expand U.S. alliances and partnerships in the region, much in the same vein as the Obama administration’s push for a “principled security network” in Asia, there’s no particular prescription for what the U.S. will need of its Asian partners in coming years. What is clear is that in its second year in office, the Trump administration is emphasising a coming period of intensified geopolitical competition with Moscow and Beijing, albeit with a dual-track approach: while the U.S. president himself maintains a positive relationship with his Chinese and Russian counterparts, Washington’s defence and foreign policy machinery works to punish the two countries in various ways. Indeed, the overarching question ahead for U.S. strategy in Asia and elsewhere will be whether the competitive agenda outlined in the national security strategy and the national defence strategy synopsis will be operationalised despite Trump. During his state-of-the-union speech, for instance, Trump passed over an opportunity to address the question of the great power contest; instead, he chose to focus narrowly on North Korea, terrorism and his long-standing grievances on trade. As Washington lurches toward fully and openly embracing a long-simmering great power contest with Beijing, policymakers there should recall that China gets a vote. The recent surge in Chinese hard power capabilities combined with Beijing’s geoeconomic efforts to seal in regional influence through the Belt and Road Initiative will leave the Trump administration – and future U.S. administrations – with a tall task.